Currently, small point-of-care sensors exist to detect lead in blood and water, but no such sensor exists to detect manganese. Manganese is an essential element needed by the body for basic cellular functions, but at higher levels, it is a potent neurotoxin that can accumulate in the brain and cause impairment. Current methods to detect this metal are expensive and time-consuming, involving either processing toenail clippings or hair, or taking blood draws in excess of 5 milliliters. Lead is another powerful neurotoxin that can cause lifelong deficits in IQ and academic achievement. Both metals are often discharged to the environment by industrial activities or manufacturing plants, while manganese is also a naturally occurring trace metal commonly found in the environment. “This means research is often slow, with results coming in months after samples are collected. 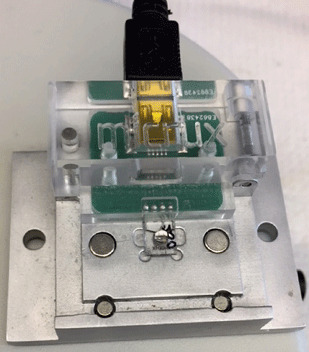 Our sensors could help speed research so that scientists can get answers faster,” Papautsky said. “We want the sensor to be easy for anyone to use, and the results easy to interpret,” Papautsky said. They will also investigate whether free manganese — manganese ions that aren’t bound to proteins — can provide useful information on total blood levels of manganese. “Free manganese is much easier to measure than total manganese levels with our sensors, so if free manganese readings turn out to be accurate indicators of the total levels, we will further optimize the sensors to focus on free manganese,” Papautsky said.